Cool CD Ripper is an extremely easy-to-use CD ripper for Convert CD to MP3, CD to WMA, CD to WAV, CD to Ogg Vorbis files. It rips audio CD tracks and save them into audio formats MP3, WAV, WMA (Windows Media Audio 9), and OGG Vorbis on-the-fly. It uses lame encoder of newest version(3.9.31) that supports full MP3 options with VBR properties, also it supports WMA v9 format(VBR also supported). Free CDDB is supported. Convert CD to MP3, CD to WMA, CD to WAV, CD to Ogg Vorbis file. Rip audio CD tracks to audio files of MP3, WMA, Ogg Vorbis and WAV format. Support both ID3V1 and ID3V2 MP3 tags. Support Windows Media Audio 9 format. Convert CD tracks fast and Easy. Easy Real Converter - Convert Audio or Video MP3, WAV, AVI, MPEG and more to RM media. CD To MP3 Ripper - Convert CD to MP3, WAV, WMA, OGG, VQF on-the-fly. Audio MP3 Converter - convert mp3, wav, wma, ogg, vqf on-the-fly. 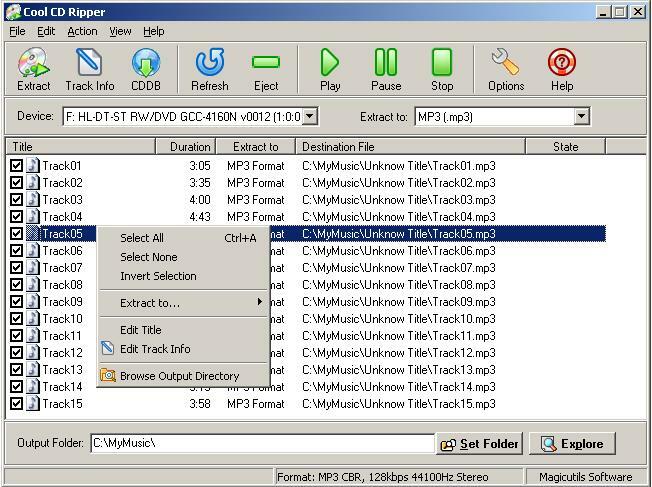 Easy CD Ripper - Convert CD tracks into MP3, WAV, WMA and VQF files quickly easily. MP3 CD Converter - burn your favorite MP3 files on audio CD easily.